← Daniel Fast Blogger is baaaack! 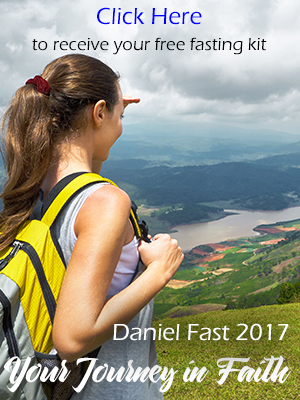 Take a look at this site: http://danielfastresearch.com and see reports about the clinical studies that show that amazing health benefits of the Daniel Fast. It sounds like God is working His perfect timing in you! just found out that my cholesterol has gone up .. just in time for our church to start the Daniel Fast.. thanks for this little blurb to encourage me on this Spiritual and Fitness Journey! Gilbert, the reason herbal teas are not allowes is because they aren’t water – the only allowed beverage on the Daniel Fast. So cinnamon tea would also be out. The fine line is that if you can still call in all honesty call the beverage “water” then it would be allowed. Thus, water with lemon slices would be allowed. But the beverage you described as a “tea” would not. No herbal teas but can one drink cinnamon tea? Praise God for your good report! Kim, I am so glad you posted this information. So many people would be in much better health if they would just change their diet to a healthy way of eating! The balanced Daniel Fast provides everything we need for good health. Your husband’s great reports show that! I hope the doctor was blessed with the reason for the change! My husband, daughter and I are on the Daniel Fast for Lent and have been on it for 28 days now. My husband, a former carnivore, had his cholesterol taken right before we started the fast on 2/9/10, and it was a whopping 309. He had it retaken about 5 weeks later on 3/11/10 after having been on the fast for about 4 weeks, and it had dropped to 152 without the help of medication! You can’t argue with the numbers and facts. This change in eating will remain a way of life for us. I encourage you to look over this blog and the website at http://Daniel-Fast.com to learn more about the fast. The best way to assure a successful fast is to read The Daniel Fast book, which includes all kinds of information about the fast, more than enough recipes for a 21-day Daniel Fast, plus a daily devotional. You can get it at all the major bookseller or from http://Daniel-Fast.com/store.html. we need some receipes for the Daniel fast diet. We also need to know if it is healthy to follow this plan for an extended period of time. I encourage you to go to http://www.Daniel-Fast.com and get a copy of the The Daniel Fast Guidelines. Then compare it with what you know about hypoglycemia. Then, in the company of the Holy Spirit, put together an eating plan that will bring helath to your body and comply as much as possible with the Daniel Fast Guideines. What impact does this diet have on those with the opposite of diabetes? I am Hypoglycemic (not Hyper-). putting together a meal plan. I also just found out that my cholesterol count is even higher than last year. I sense God is trying to help me get healthy.